From I-695 (Baltimore Beltway), take Exit 19 onto I-795. Follow I-795 to first exit onto Owings Mills Boulevard. Stay in the right lane and bear right towards Reisterstown Road (do not go towards Owings Mills Town Center). Turn right at second signal, then immediately turn left at signal onto Reisterstown Road, staying in the right lane. Take first right turn immediately after crossing over the embedded railroad tracks, but before going under the bridge. 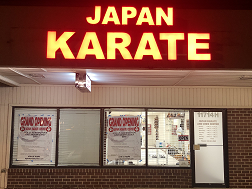 (There will be a visible sign for the Japan Karate and Judo Center). Go up the driveway, and the Dojo is on the second floor of the second building on the left.